김홍도필(金弘道筆) 은 조선 후기의 화가 단원 김홍도(1745∼? )가 그린 산수화와 풍속화 등을 모은 화첩이다. 김홍도는 산수화와 인물화, 신선화와 풍속화 등을 모두 잘 그려서 풍속화에서는 새로운 경지를 개척하였고, 산수화와 화조화 등에서는 자기만의 뚜렷한 화풍을 이룩했다. 총 20면으로 된 이 화첩에 있는 각 그림의 크기는 가로 36.6㎝, 세로 26.7㎝ 정도이고, 그림은 종이에 먹으로 그린 후 엷게 색칠하였다. 한지에 그린 그림을 두껍고 빳빳한 양지에 붙여 10면을 1첩으로 하여 2첩을 한 갑에 넣어 1면씩 열어 볼 수 있도록 만들었다. 단양 8경의 하나인 사인암을 그린 것으로 추정되는 산수화에도 그의 특색이 잘 나타나는데 바위산의 모습을 근접한 시점에서 화면 가득히 배치하여 그 위용을 잘 나타내고 있으며 농도와 크기를 달리하는 점과 선들을 자유롭게 사용하여 화면에 강약과 변화를 주고 있다. 김홍도가 51세 때인 정조 20년(1796)에 그린 것으로 단원화풍의 연구에 귀중한 자료가 된다. This is a picture album of the famous painter, Kim Hong-do (pen-name Danwon, 1745~?) from mid Joseon. The 20 pages of the album contain his landscape and genre painting. Each picture measures 36.6cm by 26.7cm. 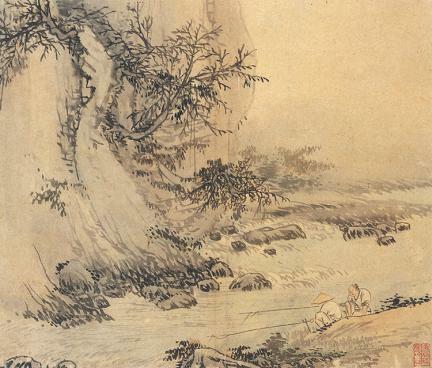 He created a large number of pictures and was very good at many kinds of painting including landscapes, portraits and pictures of mountain spirits. He drew these pictures in this album in the spring of 1796, the 20th year of King Jeongjo, when he was 51. He painted them lightly on Korean paper with India ink, and attached thick, crisp paper behind the pictures, making 10 pictures in one set. This album is composed of two sets and one can open and see each page. Apart from accomplishing many literary works, Danwon also broke new ground in landscape painting and paintings of flowers and birds. 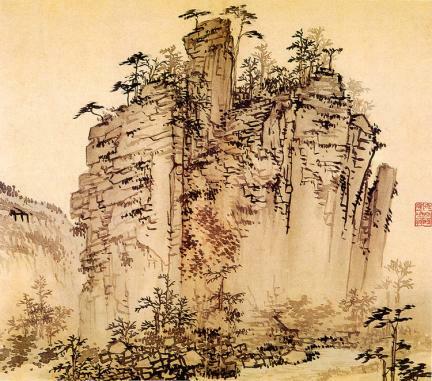 A picture of Sainam Rock, one of the 8 scenic views of Danyang, which is believed to have been painted by him, shows his unique style. In this picture, the rock is shown in close-up, filling the whole frame. This is a valuable artwork for studying the style of Danwon, with the artist using dots of varying size and densities and freely drawn lines.